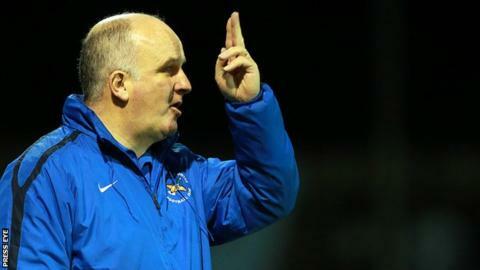 Ballinamallard United manager Whitey Anderson has had a three-match touchline ban reduced to one game by an Irish FA disciplinary committee. Anderson received his suspension for comments made in an interview with BBC Sport NI after his club's 2-0 defeat at home to Cliftonville on 12 October. He described referee Colin Burns' decision to send off goalkeeper Alvin Rouse on seven minutes as "shocking". A £150 fine handed to Ballinamallard has also been reduced to £75. In the BBC interview, Anderson claimed his club had been on the wrong end of a number of decisions in games against Belfast teams. The Ballinamallard manager's one-match ban will now take effect from Monday which will means that he will have to sit in the stands for the game at Ballymena on 30 November.